Homemade bread is a real treat, and this recipe makes the best, freshest, most wholesome naan, no special equipment necessary – any skillet will do. Don't be afraid of yeasted breads! Working with yeast is easier than you think. Sure, some kneading is needed – good exercise to strengthen your arms – but after that, the resting dough takes care if itself, as the yeast introduce the airy, fluffy bubbly-ness that makes bread so delicious. Naan is usually white flour, yeast, salt and enough yogurt to make a smooth, elastic dough. Here, I combine whole wheat flour with the white flour to make this a more nutritious bread. 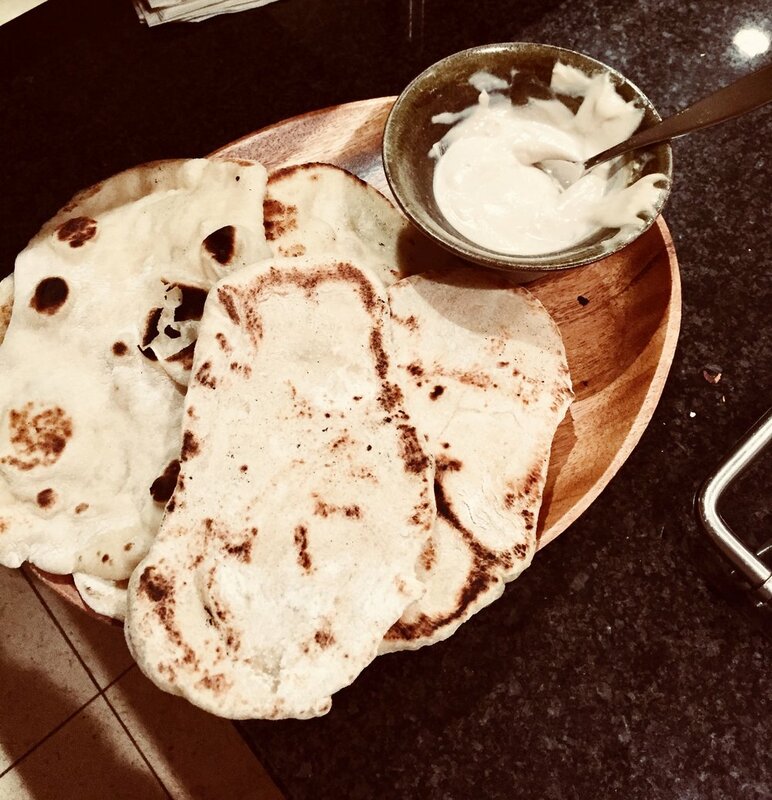 You can bake the naan breads ahead, and wrap in a tea towel to keep them cosy, but I prefer to make them when my family or guests are already gathered in my open kitchen, and enjoy their delight in seeing the naan puff up and get its lovely brown marks. There's nothing like a warm naan fresh off the skillet! Melted butter or ghee (optional). In a small bowl, put the yeast and warm water, dust with a sprinkle of flour, and combine. Let sit for about 10 minutes, until yeast becomes foamy. In a large bowl place both types of flours, yogurt, oil, salt and yeast mixture. Mix to blend, and knead until smooth and elastic. This can be done in a stand mixer with the dough hook (2-3 minutes), or by hand (knead 7-10 minutes). Dough should be soft, elastic, and not sticky. Add flour or water if needed. Cover the dough with a kitchen towel or plastic wrap, and place in a warm place until doubled in size. On a floured surface divide the dough into 8 equal portions. Roll to a disk, and shape into a circle or teardrop -- your choice. Heat a skillet (heavy one preferred) over high heat, slightly oil with canola or another vegetable oil. Place the dough on the warm skillet. When it puffs up and bubbles and brown spots appear, flip the naan and cook the other side. Alternatively, naan can be baked in the 450 °F oven, preferably on a baking stone. Naan can be brushed with some melted butter or ghee (optional). Serve immediately or wrap in a tea-towel to keep warm and fresh.